If you’re looking for a modern twist for your displays, then our bamboo cones are the perfect choice. These are an unusual alternative to regular plates or bowls, and turn any culinary treat into a handheld masterpiece. Guests will love the fun and unique shape of our bamboo cones, and they will also appreciate your choice in eco-friendly tableware. Our bamboo cones are made of high-quality, all-natural material. Thus, they are 100% biodegradable and organic, so you won’t have to worry about your carbon footprint when purchasing these disposables. Bamboo is a very sustainable resource, so this is a better choice than palm leaves or similar materials. In fact, bamboo is one of the fastest growing plants in the world, so it is one of the eco-friendliest resources on the market. Since these cones are disposable, cleaning us is quick and easy. Bamboo is also very durable, so these cones are resilient enough to successfully serve delicious dishes. However, due to the design of these cones, they may not be the best choice for liquids like drinks or brothy soups. Instead, try these out for dry appetizers or finger foods. These cones are very versatile, so you can display any dry foods from chips to pieces of cheesecake. The natural material makes each food cone different. Much like tie-dyed t-shirts, each cone has its own personality depending on the bamboo sheath used. The natural brown hues add rustic flair to any table setting while also showing off its positive relationship with our environment. The neutral design and colors help our bamboo cones match well with any theme. They also contrast well with many foods, especially vibrant colors. So these bamboo cones will only make your fruit, macarons, or other treats stand out to everyone at the table. The design of our bamboo cones ensures that they will not fall apart when guests enjoy your delicious creation. Each cone is made with premium materials, so they are one of the best options on the market. The wrapped shape also hold foods easily, so you won’t waste time fighting with our bamboo cones. Our bamboo cones incline on one side, so they can hold taller treats easily. Each cone is specifically made to withstand any culinary masterpiece, and to successfully display it classily to your guests and customers. Now, you might be thinking of logistics and how it may be difficult to serve two cones simultaneously because they aren’t able to stand on their own. Don’t worry -- we have a solution. Our beautiful and convenient cone stands simplify the way you display bamboo cones. Our cone stands are built specially to fit our array of bamboo cones. They are sturdy; we build them to last as long as possible. 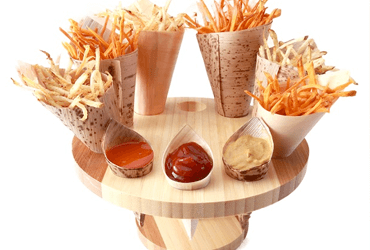 Bamboo cone stands are also perfect for displaying your culinary creations for the world to see. Not only do our cone stands create an exquisite display, but they also make it easier to serve certain dishes to customers. We have different sizes and styles, so you can pick the cone stand that fits best in your venue. Our sizes vary and contain different numbers of slots, so you have the choice of how many cones to display at one time. For instance, our Full Moon Bamboo Cone Stand has 10 slots, will our Oblong Bamboo Cone Stand has 20 slots. Each are fashionable, but they are both great choice for different scenarios depending on the number of cones you want to display. The most slots you can get is 36 slots, while the least you can get is five. You could also use multiple cone stands to create and extraordinary display that sets your apart from competitors. Bamboo cones and cone stands are perfect for many different settings. These are great for buffet-style events, weddings, banquets, food trucks and many more eateries. Guests will love the fun and simple display that allows them to continue to mingle with friends without interruption. Using our bamboo food cones let guests and customers move around freely as opposed to sitting at tables eating off plates. Your guests won’t get enough of eating out of these fun and unique cones. Our bamboo cones also come in different sizes. We have three main sizes -- 3-inch, 5-inch, and 7-inch. You can either pick the perfect size for the dish you’re planning on serving, or you can mismatch the sizes for an entirely new experience. For instance, you can serve some sweet and savory sweet potato fries in our 7-inch bamboo cone, while pairing it with a sweet cream sauce served alongside in our 3-inch cone. Your customers will love the ease of eating these foods out of our bamboo cones. You won’t regret using our bamboo cones and stands in your restaurant, cafe, catering business, or other establishment. These are a great alternative to regular plates, cups, or bowls because they are modernly designed with a fashionable flair. These products are also 100% organic and biodegradable, so they are easy on the environment as well. The versatility and durability of our bamboo cones and cone stands add character to any setting and will surely impress all guests and customers. Like stated before, bamboo cones are perfect for many different types of foods. Whether you are a caterer, baker, or griller, you will surely find many uses for our bamboo cones. You and your imagination have control over what our bamboo cones display. From appetizers to desserts, our bamboo cones are the perfect solution for easy presentations.